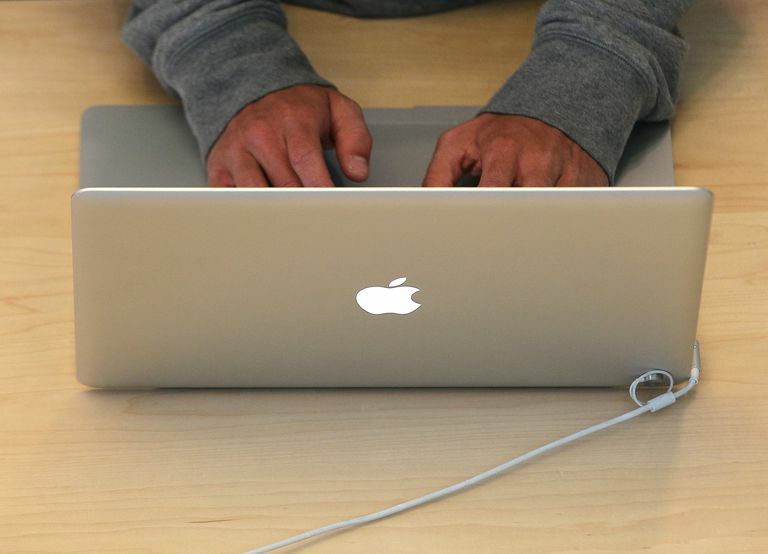 If your MacBook Pro will not turn on or shut down, here's a list of quick fixes you can try. These instructions cover all Macintosh notebook computers: MacBook Pros, MacBooks, and MacBook Airs. All Mac notebooks have the power button in the upper right corner. The trick is, some newer models don't have the icon for power printed on the power key. The don't because some models have Touch ID and that would interfere in reading a fingerprint. To turn on your Mac, press the power button until your screen comes to life with the Apple logo. When you press the power button, listen for the Mac's start-up chimes, or the sound of the fan. Also, look for lights on your keyboard from the backlight (if on from the previous session) or a light from the caps lock key, if activated. Check the Display. There's always the chance your display is turned way down, so after pressing the power button for a couple of seconds, try raising the brightness (upper left buttons with icons that look a bit like a sun). Disconnect Accessories. Disconnect all accessories that are plugged into your Mac, including printers, mobile devices, video displays, and USB cords. Try to restart your Mac with these items unconnected. Check the Power Source. Look at all of the power connections to make sure all power sources are securely plugged into your MacBook and the AC outlet is working. If the battery on your Mac is completely dead, you may need to give your computer a few minutes to recharge into an AC outlet before your device has enough juice before to power on again. Special Power Cycle. We're closing in on all you can do. The power cycle mode goes like this: Unplug the power cable from your Mac (if the battery is removable, take it out). Hold down the power button for 10 seconds. Plug the power cable back into your Mac, or reinstall the battery, while simultaneously holding the power button. Hold for ten seconds. Release the button, and try to start your Mac. If these fixes do not work, go over a checklist, or contact Apple Support. You can also visit an Apple Store or Apple Authorized Service Provider for help. All Macs (notebooks and desktops) turn off the same way: Click on the Apple logo in the top left of your screen and select Shut Down. An alert warning that your Mac will shut down in 1 minute, giving you the opportunity to save work from other programs and apps. Hold down the Command key while choosing Shut Down to bypass the 1-minute countdown and shut down immediately. Once all the apps and programs are closed, your computer should shut down. Sometimes applications become unresponsive and stop the Mac's operating system from shutting down properly. Here's how to "force quit" unresponsive apps. Click the Apple menu (upper left corner) and select the menu item labeled Force Quit. If you are keyboardy person, just hold down this three-key combination: Command + Option + Esc and the Force Quit window will appear. Click the name of the application you believe is stuck and then click Force Quit. Once you force the stuck app to quit, trying shutting down again. If force quitting doesn't solve your problem, hold down your Mac's power button and, after a few seconds, the computer will turn off. Unfortunately, if you have to go this route you'll lose any unsaved work. If none of the above steps are solving your issue, related to turning on or shutting down your MacBook Pro, your MacBook may need professional care. Visit an Apple Store or Apple Authorized Service Provider for help.